CAST STONE LARGE MONK ON ELEPHANT GARDEN STATUE - dimensions approx: H49 x W30 x L52 cm / H19 x W12 x L20.5/ 55 kg. This charming decorative piece features a young Buddha lying on top of an ornately decorated elephant. 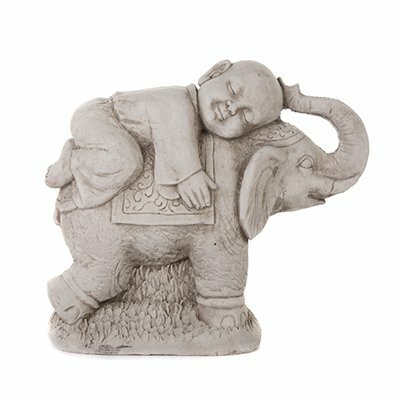 The combination of the Buddha's yoga style child pose, and the elephant's symbolism, makes this an auspiciously lucky ornament to place in your garden. Onefold offers a large selection of garden ornaments manufactured with the decades-long tradition and experience. All our ornaments are hand-made to ensure the very best quality. They are also hand-finished to ensure the perfection in details and perfectly aged to give them an antique apperance. Our ornaments meet the highets criteria - they are made in England from weather and frost-proof compound. Onefold represents a standart that is hard to beat for this kind of products!